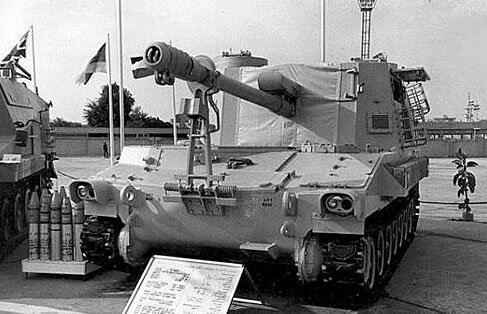 The Egyptian SP122 Self Propelled Gun was developed by the former US Firm BMY Combat Systems, now United Defence LP for the Egyptian Army. The vehicle isn’t purely an American vehicle, but uses the Egyptian Licence built Russian D-30 122mm main gun. The vehicle consists of the chassis of the successful M109 SPG series (M109A2) with an enclosed superstructure on the top (non traverse turret). The decision to use the Russian D-30 was due to the weapon being built for many years under licence in Egypt and thus there being an ample and readiness supply of the munitions for the D-30. The gun can be elevated from -5 to 70+ degree’s and has a manual traverse left and right of 30 degree’s. It has a range of 15.3km for non rocket assist High Explosive rounds. The vehicle uses a Detroit 8V-71T turbocharged diesel engine, which generates 405hp. This gives a top road speed of 56km/h and road range of 349km. Roughly 124 vehicles have been built, with final vehicles completed in 2000. The vehicle compliments Egypt’s various more capable models of the US M109 SPG. It has not been exported.